Was it Barcelona winning the Champions League, or Poland having a record 10-0 win over San Marino? Was it Roger Federer beating Roland Garros? Or maybe the Polish men’s volleyball team striking gold at the European Championships? Or maybe you’d prefer a dramatic moment: Wisła Krakow losing to Estonian side Levadia, Marcin Wasilewski having his leg split in two, or the handball that got France and not Ireland into the 2010 World Cup. Maybe you’re inclined to remember a whole season instead of a special moment: The epic rivalry between Alberto Contador and the returning Lance Armstrong in this year’s Tour de France, the almost unbelievable season in Formula One for the Brawn GP team and Jenson Button, or the last football season in which Wisła Krakow successfully defended and prolonged the title in the Ekstraklasa? In short, what would your most memorable moment in sports be of 2009? I invite you to write to the Krakow Post and come up with suggestions and maybe we’ll pick out your moment in the first issue of 2010. Write about the moment, what you remember of it and why it fascinated you at the time. 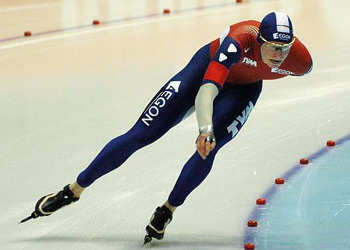 Sven Kramer is a Dutch speed skater who has dominated the men’s speed skating world ever since he entered the elite group of this sport back in 2006. In fact, on his speciality, the five kilometres, he has remained unbeaten since his unbelievable record of 6’03’32 on the 5k on 17 November 2007. But, little by little, the competition has became stronger. There was Norwegian Harvard Bøkko, Italian Enrico Fabris, fellow Dutchman Bob de Jong and occasionally Shani Davis from the United States, who have all slowly but firmly chipped away the huge advantage that Sven the man had over the rest of the pack. And then, on 14 November 2009, they all arrived at the speed skating stadium of Heerenveen, home soil to Sven Kramer. But Kramer was sick with the flu. And with 6’16’38 on the clocks everybody was rocked by the fact that Sven could actually lose this race. His direct opponent, Harvard Bøkko, sprinted away from the visibly ill Kramer and the Dutch superman, who was supposed to be guaranteed at least three golden medals at the 2010 Winter Olympics, already seemed to be waving the white flag; he did not do a warm-up prior to the race and had not eaten in the twelve hours before he started. When everybody started to accept that Sven Kramer would suffer his first defeat in two years, Kramer did the unthinkable: suddenly he increased speed and frequency. All of a sudden it wasn’t a long distance race anymore, but a sprint: laps beneath 30 seconds, even one below 29 seconds…. it was unbelievable. On the last corner Kramer dived on the inside of Harvard Bøkko and overtook his opponent. He clocked in at 6’16’29, nine hundredths of a second quicker than Bob de Jong. Judging by his squeaky voice afterwards, Kramer really gave it his all. But it was his pride, his unbeaten tally for so long and the fact that he was racing in his home town in front of his home crowd, that suddenly resulted in an impossible five final laps. It was the most incredible thing I have ever witnessed in speed skating and that’s why it’s my moment of 2009. The will to win, the eternal refusal to yield and the pride to race for yourself and for your country was what kept Sven Kramer on both legs and on top of the podium. I’m already looking forward to the 2010 Winter Olympics in Vancouver. What’s your pick? Tell us in the comments below!